Ford Motor Co. recently announced that it will be investing $1 billion in its Chicago assembly and stamping plants while adding 500 new jobs as it prepares to launch three new sport-utility vehicles (SUVs). The transformation at the plants, which will begin in March and be completed later in the spring of 2019, will expand capacity for the production of the new Ford Explorer, Police Interceptor Utility and Lincoln Aviator. The additional 500 full-time jobs will bring total employment at the two plants to approximately 5,800 people. "Today, we are furthering our commitment to America with this billion-dollar manufacturing investment in Chicago and 500 more good-paying jobs," said Joe Hinrichs, Ford's president of global operations. With the investment, Ford will build a new body and paint shop at the Chicago assembly plant while making major modifications to the final assembly area. At the stamping plant, the company will be adding new stamping lines. Advanced manufacturing technologies at the plants will include a collaborative robot with a camera that inspects electrical connections during the manufacturing process. In addition, several 3D printed tools will be installed to help employees build these vehicles with even higher quality. Employee-related improvements will total $40 million and include new LED lighting, cafeteria updates, break areas and security upgrades in the parking lot. 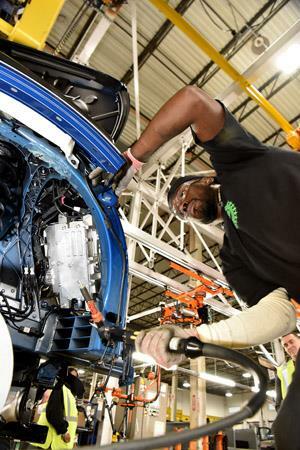 "Ford's announcement of 500 additional jobs and over $1 billion in plant investments is a testament to the quality and hard work of UAW Ford members," said Rory Gamble, vice president of the UAW Ford Department. "Ford's investment announcement demonstrates a commitment to the dedication of UAW members in Chicago." The Chicago assembly plant is Ford's longest continually operating vehicle assembly facility. The factory started producing the Model T in 1924 and was later converted to war production during World War II. For more information, visit www.ford.com.